Introducing: ASK U – a breakthrough solution that presents The Asking Formula as a mobile and practicable learning application. This companion program to the keynote speech or workshop reinforces learning and personal growth… extending it beyond one-time, event-based training. Contact us to discover if ASK U is an effective fit with your keynote or workshop program. We can help coordinate a launch event that makes an impact on your audience. Technology and cloud-based connectivity have revolutionized learning and training, especially for companies with a geographic diverse workforce or groups who are required to travel. We’ve partnered with an expert in online learning and mobile technology to create ASK U for the iPad, iPhone, and Android devices. 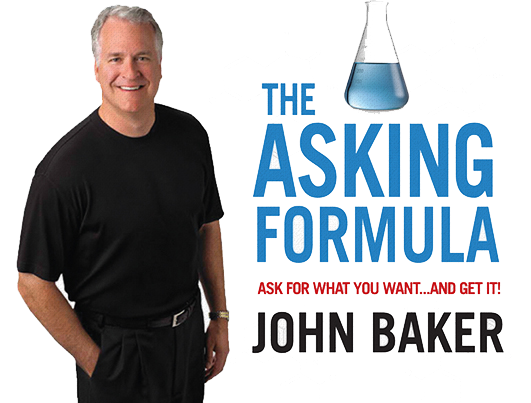 ASK U creates an Asking Formula “community” for your people to interact and collaborate online. ASK U users learn ongoing lessons from John Baker, practice and share their asking behaviors, receive helpful motivation from their peers, and earn achievements from their manager. REINFORCE l Users have instant access to video that focuses on messages learned in John’s workshop as well as a series of scheduled email and video lessons/updates. REPEAT l Using video capture within an iPad, iPhone or Android device, it’s simple for a user to practice their best “asking behavior,” self-appraisee it, re-record it, and share it with his feedback circle. REVIEW l Once a user has perfected his asking behavior, he sends a final recording to his Manager, who provides immediate feedback and measures the user’s progress and performance. REWARD l A Manager scores and rewards his teams’ submission; runs contests; distributes awards, recognition, and “BFAs” (Big Fat Asks); shares “leaderboards” and more to create a competitive, gaming atmosphere. Reporting is real-time and actionable to motivate users’ performance. Mel attends The Asking Formula workshop. The following day, he receives a follow-up email with information about registering for and downloading ASK U from iTunes. Mel watches a short video lesson from John Baker and the first exercise of the series to continue developing his asking skills. Periodically over the next six months, Mel receives ASK U notifications to watch videos and complete the exercises. To further reinforce what Mel is learning, John Baker invites Mel to online events on topical subjects. Mel practices responses to each lesson with his iPad (or iPhone) video camera and participates with his peers in feedback circles to which he’s been assigned. Mel’s Manager has a real-time ASK U snapshot of who on her team is performing the exercises well and who needs encouragement or additional coaching. She can also see the lessons each individual has completed. She gets a monthly report of activity, status, performance, etc. that can be shared with her boss, her VP of Sales…anyone! When confident his asking situation is in good form, Mel shares it with his feedback circle — a predefined group of his peers; they watch Mel’s video. Mel’s company can also have John Baker as a Coach in the feedback circle. After careful consideration and reflection of what they have learned about asking behaviors, they provide their critiques — by video or audio recording (or text). Mel refines his response to an exercise after hearing from his feedback circle. He’s confident that he’s nailed it; he records it and sends to his Manager for review. Mel’s Manager assesses his video exercise and provides immediate feedback… gaining her real-time visibility into Mel’s — and her team’s — progress and performance. If it’s so very gosh darn good, she declares Mel’s video a “BFA” (Big Fat Ask) and shares it with other teams, motivating Mel for continued good performance. Huzzah!